The Book of Psalms (Hebrew: תְּהִלִּים or תהילים Tehillim meaning "Praises"), commonly referred to simply as Psalms or "the Psalms", is the first book of the Ketuvim ("Writings"), the third section of the Hebrew Bible. The English title is from the Greek translation, ψαλμοί psalmoi, meaning "instrumental music" and, by extension, "the words accompanying the music." There are 150 psalms in the Jewish and Western Christian tradition (more in the Eastern Christian churches), many of them linked to the name of King David, but his authorship is not generally accepted by modern Bible scholars. 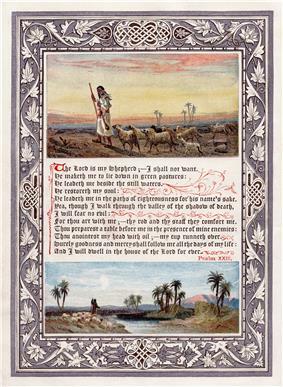 An 1880 Baxter process illustration of Psalm 23, from the Religious Tract Society's magazine The Sunday at Home. Many psalms (116 of the 150) have individual superscriptions (titles), ranging from lengthy comments to a single word. Over a third appear to be musical directions, addressed to the "leader" or "choirmaster," including such statements as "with stringed instruments" and "according to lilies." Others appear to be references to types of musical composition, such as "A psalm" and "Song," or directions regarding the occasion for using the psalm ("On the dedication of the temple," "For the memorial offering," etc.). Many superscriptions carry the names of individuals, the most common (73 psalms) being of David, and thirteen of these relate explicitly to incidents in the king's life. Others named include Asaph (12), the Sons of Korah (11) and Solomon (2). The most natural way of understanding these attributions is as a claim to authorship, but it could also mean "to David" or "for David". J. W. Rogerson and J. W. McKay, writing in the Cambridge Bible Commentary, suggest that the three main interpretations of the attribution are (a) Davidic authorship, (b) "belonging to the Davidic collection", and (c) a misguided claim to Davidic authorship added by a later editor. Rogerson and McKay conclude that "there is probably some truth in all three of these views." Geoffrey Grogan notes that "many scholars now accept that some psalms may be by David, but others deny this." For the remainder of this article, the Hebrew numbering is used, unless otherwise noted. The variance between Massorah and Septuagint texts in this numeration is likely enough due to a gradual neglect of the original poetic form of the Psalms; such neglect was occasioned by liturgical uses and carelessness of copyists. It is admitted by all that Pss. 9 and 10 were originally a single acrostic poem; they have been wrongly separated by Massorah, rightly united by the Septuagint and Vulgate. On the other hand Ps. 144 is made up of two songs — verses 1–11 and 12–15. Pss. 42 and 43 are shown by identity of subject (yearning for the house of Jahweh), of metrical structure and of refrain (cf. Heb. Ps. 42:6, 12; 43:5), to be three strophes of one and the same poem. The Hebrew text is correct in counting as one Ps. 146 and Ps. 147. Later liturgical usage would seem to have split up these and not a few other psalms. Zenner (Die Chorgesange im Buche der Psalmen, II, Freiburg im Br., 1896) ingeniously combines into what he deems were the original choral odes: Pss. 1, 2, 3, 4; 6 + 13; 9 + 10; 19, 20, 21; 156 + 157; 69 + 70; 114 + 115; 148, 149, 150. A choral ode would seem to have been the original form of Pss. 14 + 70. The two strophes and the epode are Ps. 14; the two antistrophes are Ps. 70 (cf. Zenner-Wiesmann, Die Psalmen nach dem Urtext, Munster, 1906, 305). It is noteworthy that, on the breaking up of the original ode, each portion crept twice into the Psalter: Ps. 14 = 53, Ps. 70 = 40:14–18. Other such duplicated psalms are Ps. 108:2–6 = Ps. 57:8–12; Ps. 108:7–14 = Ps. 60:7–14; Ps. 71:1–3 = Ps. 31:2–4. This loss of the original form of some of the psalms is allowed by the Biblical Commission (1 May 1910) to have been due to liturgical uses, neglect of copyists, or other causes. The Septuagint bible, present in Eastern Orthodox churches, includes a Psalm 151; a Hebrew version of this was found in the Psalms Scroll of the Dead Sea Scrolls. Some versions of the Peshitta (the bible used in Syriac churches in the Middle East) include Psalms 152–155. There are also the Psalms of Solomon, which are a further 18 psalms of Jewish origin, likely originally written in Hebrew, but surviving only in Greek and Syriac translation. These and other indications suggest that the current Western Christian and Jewish collection of 150 psalms were selected from a wider set. Hymns, songs of praise for God's work in creation or in history. They typically open with a call to praise, describe the motivation for praise, and conclude with a repetition of the call. Two sub-categories are "enthronement psalms," celebrating the enthronement of Yahweh as king, and Zion psalms, glorifying Mount Zion, God's dwelling-place in Jerusalem. Gunkel also described a special subset of "eschatological hymns" which includes themes of future restoration (Psalm 126) or of judgment (Psalm 82). Communal laments, in which the nation laments some communal disaster. Both communal and individual laments typically but not always include the following elements: 1) address to God, 2) description of suffering, 3) cursing of the party responsible for suffering, 4) protestation of innocence or admission of guilt, 5) petition for divine assistance, 6) faith in God's receipt of prayer, 7) anticipation of divine response, and 8) a song of thanksgiving. In general, the difference between the individual and communal subtypes can be distinguished by the use of the singular "I" or the plural "we". However, the "I" could also be characterizing an individual's personal experience that was reflective of the entire community. Individual laments lamenting the fate of the particular individual who utters them. They are by far the most common type of psalm. They typically open with an invocation of Yahweh, followed by the lament itself and pleas for help, and often ending with an expression of confidence. A subset is the psalm of confidence, in which the psalmist expresses confidence that God will deliver him from evils and enemies. Individual thanksgiving psalms, the obverse of individual laments, in which the psalmist thanks God for deliverance from personal distress. In addition to these five major genres, Gunkel also recognised a number of minor psalm-types, including: communal thanksgiving psalms, in which the whole nation thanks God for deliverance; wisdom psalms, reflecting the Old Testament wisdom literature; pilgrimage psalms, sung by pilgrims on their way to Jerusalem; entrance and prophetic liturgies; and a group of mixed psalms which could not be assigned to any category. The composition of the psalms spans at least five centuries, from Psalm 29, adapted from early Canaanite worship, to others which are clearly from the post-Exilic period. The majority originated in the southern kingdom of Judah and were associated with the Temple in Jerusalem, where they probably functioned as libretto during the Temple worship. Exactly how they did this is unclear, although there are indications in some of them: "Bind the festal procession with branches, up to the horns of the altar," suggests a connection with sacrifices, and "Let my prayer be counted as incense" suggests a connection with the offering of incense. Seventy-three of the 150 psalms in the Bible are attributed to King David, one of the Dead Sea Scrolls (11QPsa) attributes 3600 tehilim (songs of praise) plus other compositions to him. Nevertheless, there is no hard evidence for Davidic authorship of any of them. "Davidic authorship is not accepted as historical fact by modern scholars," note Adele Berlin and Marc Zvi Brettler in the Jewish Study Bible, but is seen rather as the way in which the ancients "confirm[ed] the divine inspiration and authority" of the writings by linking them to well-known biblical figures. Acts 4:25 states that Psalm 2 is by David. Acts 2:25-28 states that Psalm 16 is by David. Romans 4:6-8 contains parts of Psalms 32 and this passage is stated to be by David. Hebrews 4:7 states that Psalm 95 is by David. 1 Chronicles 16:7-36 contains parts of Psalms 96, 105 and 106, and this passage is stated to be by David. Matthew 24:43-44, Mark 12:36 and Luke 20:42 Jesus attributes part of Psalm 110 to David. Acts 2:34-35 also states that Psalm 110 is by David. Most individual psalms involve the praise of God – for his power and beneficence, for his creation of the world, and for his past acts of deliverance for Israel. The psalms envision a world in which everyone and everything will praise God, and God in turn will hear their prayers and respond. Worst of all is when God "hides his face" and refuses to respond, because this puts in question the efficacy of prayer, which is the underlying assumption of the Book of Psalms. Some psalms are called "maskil" (maschil) because in addition they impart wisdom. Most notable of these is Psalm 142 which is sometimes called the "Maskil of David", others include Psalm 32 and Psalm 78. The term derives from maskil meaning "enlightened" or "wise". David Playing the Harp by Jan de Bray, 1670. Individual psalms were originally hymns, to be used on various occasions and at various sacred sites; later, some were anthologised, and might have been understood within the various anthologies (e.g., ps.123 as one of the Psalms of Ascent); finally, individual psalms might be understood within the Psalter as a whole, either narrating the life of David or providing instruction like the Torah. In later Jewish and Christian tradition, the psalms have come to be used as prayers, either individual or communal, as traditional expressions of religious feeling. Some bear the Hebrew designation shir (שיר; Greek ode, a song). Thirteen have this title. It means the flow of speech, as it were, in a straight line or in a regular strain. This title includes secular as well as sacred song. Fifty-eight Psalms bear the designation mizmor (מזמור; Greek ψαλμός psalmos, a psalm), a lyric ode, or a song set to music; a sacred song accompanied with a musical instrument. Psalm 145, and many others, have the designation tehillah (תהילה; Greek hymnos, a hymn), meaning a song of praise; a song the prominent thought of which is the praise of God. Tehillah is also the singular of the name of the book in Hebrew, Tehillim. Six Psalms (16, 56–60) have the title michtam (מכתם; "gold"). Rashi suggests that "michtam" refers to an item that a person carries with him at all times, hence, these Psalms contain concepts or ideas that are pertinent at every stage and setting throughout life, deemed vital as part of day-to-day spiritual awareness. Psalm 7 (along with Habakkuk ch. 3) bears the title shigayon (שיגיון). 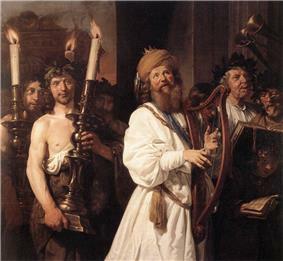 There are three interpretations: (a) According to Rashi and others, this term stems from the root shegaga, meaning "mistake" – David committed some sin and is singing in the form of a prayer to redeem himself from it; (b) shigayon was a type of musical instrument; (c) Ibn Ezra considers the word to mean 'longing,' as in the verse in Proverbs 5:19 "tishge tamid." Psalms are used throughout traditional Jewish worship. Many complete Psalms and verses from Psalms appear in the morning services ("Shacharit"). The pesukei dezimra component incorporates Psalms 30, 100 and 145 – 150. Psalm 145 (commonly referred to as "Ashrei", which is really the first word of 2 verses appended to the beginning of the Psalm), is read three times every day: once in shacharit as part of pesukei dezimrah, as mentioned, once, along with Psalm 20, as part of the morning's concluding prayers, and once at the start of the Afternoon service. On Festival days and Sabbaths, instead of concluding the morning service, it precedes the Mussaf service. Psalms 95–99, 29, 92, and 93, along with some later readings, comprise the introduction ("Kabbalat Shabbat") to the Friday night service. Traditionally, a different "Psalm for the Day" – Shir shel yom – is read after the morning service each day of the week (starting Sunday, Psalms: 24, 48, 82, 94, 81, 93, 92). This is described in the Mishnah (the initial codification of the Jewish oral tradition) in the tractate "Tamid". According to the Talmud, these daily Psalms were originally recited on that day of the week by the Levites in the Temple in Jerusalem. From Rosh Chodesh Elul until Hoshanah Rabbah, Psalm 27 is recited twice daily following the morning and evening services. There is a Minhag (custom) to say Psalm 30 each morning of Chanukkah after Shacharit: some say this “instead” of the regular "Psalm for the Day", others say this additionally. When a Jew dies, a watch is kept over the body and Tehillim (Psalms) are recited constantly by sun or candlelight, until the burial service. Historically, this watch would be carried out by the immediate family – usually in shifts – but in contemporary practice, this service is provided by an employee of the funeral home or Chevra kadisha. Many Jews complete the Book of Psalms on a weekly or monthly basis. Each week, some also say a Psalm connected to that week's events or the Torah portion read during that week. 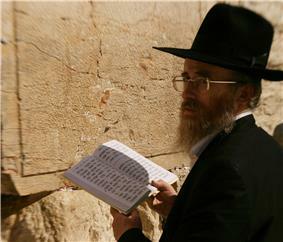 In addition, many Jews (notably Lubavitch, and other Chasidim) read the entire Book of Psalms prior to the morning service, on the Sabbath preceding the calculated appearance of the new moon. 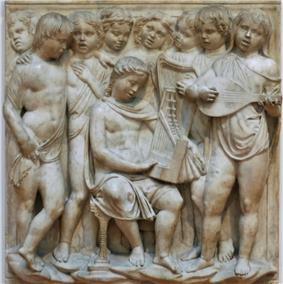 Children singing and playing music, illustration of Psalm 150 (Laudate Dominum). New Testament references show that the earliest Christians used the Psalms in worship, and the Psalms have remained an important part of worship in most Christian Churches. The Eastern Orthodox, Catholic, Presbyterian, Lutheran and Anglican Churches have always made systematic use of the Psalms, with a cycle for the recitation of all or most of them over the course of one or more weeks. In the early centuries of the Church, it was expected that any candidate for bishop would be able to recite the entire Psalter from memory, something they often learned automatically during their time as monks. Paul the Apostle quotes psalms (specifically Psalms 14 and 53, which are nearly identical) as the basis for his theory of original sin, and includes the scripture in the Epistle to the Romans, chapter 3. Several conservative Protestant denominations sing only the Psalms (some churches also sing the small number of hymns found elsewhere in the Bible) in worship, and do not accept the use of any non-Biblical hymns; examples are the Reformed Presbyterian Church of North America, the Presbyterian Reformed Church (North America) and the Free Church of Scotland (Continuing). Some Psalms are among the best-known and best-loved passages of Scripture, with a popularity extending well beyond regular church-goers. 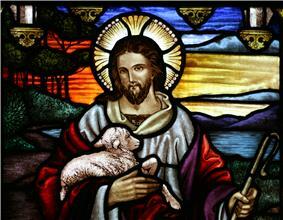 Psalm 22 is of particular importance during the season of Lent as a Psalm of continued faith during severe testing. Psalm 82 is found in the Book of Common Prayer as a funeral recitation. Psalm 137, By the rivers of Babylon, there we sat down and wept, is a moody meditation upon living in slavery, and has been used in at least one spiritual, as well as one well-known reggae song; the Orthodox church often uses this hymn during Lent. This psalm was adapted for the song On the Willows in the musical Godspell. New translations and settings of the Psalms continue to be produced. An individually printed volume of Psalms for use in Christian religious rituals is called a Psalter. At Vespers and Matins, different kathismata are read at different times of the liturgical year and on different days of the week, according to the Church's calendar, so that all 150 psalms (20 kathismata) are read in the course of a week. During Great Lent, the number of kathismata is increased so that the entire Psalter is read twice a week. In the twentieth century, some lay Christians have adopted a continuous reading of the Psalms on weekdays, praying the whole book in four weeks. Aside from kathisma readings, Psalms occupy a prominent place in every other Orthodox service including the services of the Hours and the Divine Liturgy. In particular, the penitential Psalm 50 is very widely used. Fragments of Psalms and individual verses are used as Prokimena (introductions to Scriptural readings) and Stichera. The bulk of Vespers would still be composed of Psalms even if the kathisma were to be disregarded; Psalm 119, "The Psalm of the Law", is the centerpiece of Matins on Saturdays, some Sundays, and the Funeral service. The entire book of Psalms is traditionally read out loud or chanted at the side of the deceased during the time leading up to the funeral, mirroring Jewish tradition. Several branches of Oriental Orthodox and those Eastern Catholics who follow one of the Oriental Rites will chant the entire Psalter during the course of a day during the Daily Office. This practice continues to be a requirement of monastics in the Oriental churches. The Psalms have always been an important part of Catholic liturgy. The Liturgy of the Hours is centered on chanting or recitation of the Psalms, using fixed melodic formulas known as psalm tones. Early Catholics employed the Psalms widely in their individual prayers also; however, as knowledge of Latin (the language of the Roman Rite) became uncommon, this practice ceased among the unlearned. However, until the end of the Middle Ages, it was not unknown for the laity to join in the singing of the Little Office of Our Lady, which was a shortened version of the Liturgy of the Hours providing a fixed daily cycle of twenty-five psalms to be recited, and nine other psalms divided across Matins. The work of Bishop Richard Challoner in providing devotional materials in English meant that many of the psalms were familiar to English-speaking Catholics from the eighteenth century onwards. Challoner translated the entirety of the Lady Office into English, as well as Sunday Vespers and daily Compline. He also provided other individual Psalms such as 129/130 for prayer in his devotional books. Challoner is also noted for revising the Douay-Rheims Bible, and the translations he used in his devotional books are taken from this work. Until the Second Vatican Council the Psalms were either recited on a one-week or, less commonly (as in the case of Ambrosian rite), two-week cycle. Different one-week schemata were employed: most secular clergy followed the Roman distribution, while Monastic Houses almost universally followed that of St Benedict, with only a few congregations (such as the Benedictines of St Maur) following individualistic arrangements. The Breviary introduced in 1974 distributed the psalms over a four-week cycle. Monastic usage varies widely. Some use the four-week cycle of the secular clergy, many retain a one-week cycle, either following St Benedict's scheme or another of their own devising, while others opt for some other arrangement. Official approval was also given to other arrangements (see "Short" Breviaries in the 20th and early 21st century America for an in-progress study) by which the complete Psalter is recited in a one-week or two-week cycle. These arrangements are used principally by Catholic contemplative religious orders, such as that of the Trappists (see for example the Divine Office schedule at New Melleray Abbey). responsorially (the cantor or choir sings or recites the verses while the congregation sings or recites a given response after each verse). Of these three the antiphonal mode is the most widely followed. Over the centuries, the use of complete Psalms in the liturgy declined. After the Second Vatican Council (which also permitted the use of vernacular languages in the liturgy), longer psalm texts were reintroduced into the Mass, during the readings. The revision of the Roman Missal after the Second Vatican Council reintroduced the singing or recitation of a more substantial section of a Psalm, in some cases an entire Psalm, after the first Reading from Scripture. This Psalm, called the Responsorial Psalm, is usually sung or recited responsorially, although the General Instruction of the Roman Missal, 61 permits direct recitation. Psalm 1 in a form of the Sternhold and Hopkins version widespread in Anglican usage before the English Civil War (1628 printing). It was from this version that the armies sang before going into battle. Following the Protestant Reformation, versified translations of many of the Psalms were set as hymns. These were particularly popular in the Calvinist tradition, where in the past they were typically sung to the exclusion of hymns. Calvin himself made some French translations of the Psalms for church usage, but the completed Psalter eventually used in church services consisted exclusively of translations by Clément Marot and Théodore de Bèze, on melodies by a number of composers, including Louis Bourgeois and a certain Maistre Pierre. Martin Luther's A Mighty Fortress Is Our God is based on Psalm 46. Among famous hymn settings of the Psalter were the Scottish Psalter and the paraphrases by Isaac Watts. The first book printed in North America was a collection of Psalm settings, the Bay Psalm Book (1640). By the 20th century, they were mostly replaced by hymns in church services. However, the Psalms are popular for private devotion among many Protestants and still used in many churches for traditional worship. There exists in some circles a custom of reading one Psalm and one chapter of Proverbs a day, corresponding to the day of the month. Metrical Psalms are still very popular among many Reformed Churches. Anglican chant is a method of singing prose versions of the Psalms. In the early 17th century, when the King James Bible was introduced, the metrical arrangements by Thomas Sternhold and John Hopkins were also popular and were provided with printed tunes. This version and the New Version of the Psalms of David by Tate and Brady produced in the late seventeenth century (see article on Metrical Psalter) remained the normal congregational way of singing psalms in the Church of England until well into the nineteenth century. In Great Britain, the Coverdale psalter still lies at the heart of daily worship in Cathedrals and many parish churches. The new Common Worship service book has a companion psalter in modern English. The version of the Psalter in the American Book of Common Prayer prior to the 1979 edition is a sixteenth-century Coverdale Psalter. The Psalter in the American Book of Common Prayer of 1979 is a new translation, with some attempt to keep the rhythms of the Coverdale Psalter. The Psalms are one of the most popular parts of the Bible among followers of the Rastafari movement. Rasta singer Prince Far I released an atmospheric spoken version of the psalms, Psalms for I, set to a roots reggae backdrop from The Aggrovators. Psalms have often been set as part of a larger work. The psalms feature large in settings of Vespers, including those by Claudio Monteverdi, Antonio Vivaldi, and Wolfgang Amadeus Mozart, who wrote such settings as part of their responsibilities as church musicians. Psalms are inserted in Requiem compositions, such as Psalm 126 in A German Requiem of Johannes Brahms and Psalms 130 and 23 in John Rutter's Requiem. There are also multiple contemporary popular artists, such as Soul-Junk, Robbie Seay Band, Shane and Shane, Enter the Worship Circle, Sons of Korah, and Abunoah III, who have set multiple psalms to music on various albums. In the musical Godspell the song Bless The Lord is based on Psalm 103, and On the Willows is based on Psalm 137. French singer-songwriter Léo Ferré wrote and recorded a 151st psalm on his album Amour Anarchie (1970). ^ Mazor 2011, p. 589. ^ a b Murphy 1993, p. 626. ^ a b Berlin & Brettler 2004, p. 1282. ^ Hayes 1998, p. 154. ^ Hayes 1998, pp. 154–55. ^ a b Geoffrey Grogan, Psalms, p. 34. ^ James D. Nogalski, "From Psalm to Psalms to Psalter," in An Introduction to Wisdom Literature and the Psalms: Festschrift Marvin E. Tate, p. 38. ^ J. W. Rogerson and J. W. McKay, Psalms 101-150, p. 4. ^ Day 2003, p. 11-12. ^ a b c d Day 2003, p. 12. ^ Murphy 1993, p. 627. ^ Berlin & Brettler 2004, p. 1285, note to ps.2. ^ Kselman 2007, p. 776. ^ Day 2003, p. 13. ^ Berlin & Brettler 2004, p. 1280-1281. ^ Berlin & Brettler 2004, p. 1284. ^ McKenzie, Steven L. (2000). King David: A Biography. New York: Oxford University Press. pp. 39–40. ^ Kselman 2007, p. 776-778. ^ Posted by DLC (2006-08-27). "Hebrew Language Detective: katom". Balashon. Retrieved 2012-09-19. ^ "Daily Tehillim". Daily Tehillim. Retrieved 2014-04-16. ^ "Habakkuk 3 / Hebrew – English Bible / Mechon-Mamre". Mechon-mamre.org. Retrieved 2013-03-17. ^ "Proverbs 5:19 A loving doe, a graceful deer-may her breasts satisfy you always, may you ever be captivated by her love". Bible.cc. Retrieved 2012-09-19. ^ "The Psalms of David – Sung a cappella". Thepsalmssung.org. Retrieved 2014-04-16. ^ Murrell, Nathaniel Samuel. "Tuning Hebrew Psalms to Reggae Rhythms". Retrieved 2008-02-11. Glasse, Cyril (2003). The New Encyclopedia of Islam. Rowman Altamira. Harris, Stephen L. (1985). Understanding the Bible. Mayfield. Hayes, John H. (1998). "The Songs of Israel". In McKenzie, Steven L.; Graham, Matt Patrick. The Hebrew Bible Today: An Introduction to Critical Issues. Westminster John Knox Press. Kselman, John S. (2007). "Psalms". In Coogan, Michael D.; Newsom, Carol Ann. The New Oxford Annotated Bible with the Apocryphal/Deuterocanonical Books. Oxford UNiversity Press. Mazor, Lea (2011). "Book of Psalms". In Berlin, Adele; Grossman, Maxine. The Oxford Dictionary of the Jewish Religion. Oxford University Press. Murphy, Roland E. (1993). "Psalms". In Coogan, Michael D.; Metzger, Bruce. The Oxford Companion to the Bible. Oxford University Press. Prinsloo, Willem S. (2003). "Psalms". In Dunn, James D. G.; Rogerson, John William. Eerdmans Commentary on the Bible. Eerdmans. reading of Tehillim – Psalms and many explanation. Fordham, David, ed. (Oct 1986), The Book of Psalms: In the Authorized Version (illuminated ed.) .